A perfect gift for everyone who love books! And who love to share them with friends! Half the fun of reading is sharing the love. 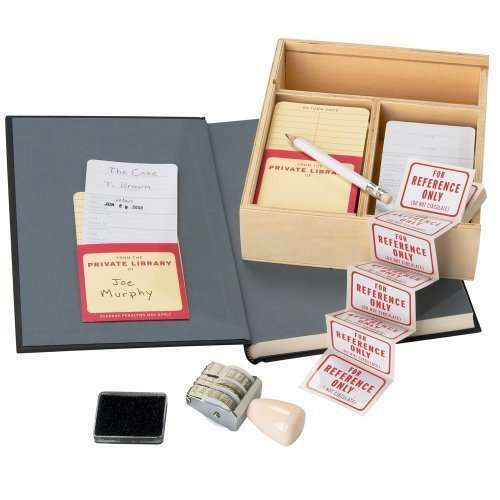 The Personal Library Kit provides everything you need to keep track of all the titles you lend. It comes with checkout cards, date stamps, an inkpad and a mini pencil. It’s a cute way to get organized and it makes a great gift for bibliophiles friends. With the Personal Library Kit you’ll always have a record of who borrowed your favourite classic novel or a brand new book of your favourite author that you just read, and just how long they’ve had it in their hands. For a bibliophile, there’s no greater pleasure than share beloved books, but no crueler pain than losing them for good—until the Personal Library Kit! Revive old-fashioned library circulation techniques for fun and book retention with our classic bestseller—now with a sleek new redesign!